Our Chomper toys come in one of five different play types. Active dogs who like to run love our play and fetch Chomper toys. Made from sturdy materials, these are perfect for throwing, fetching, squeaking, chewing, and playing. 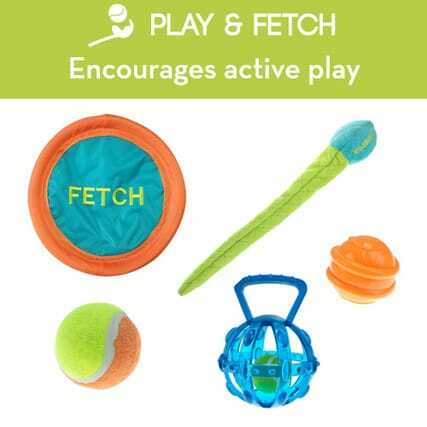 Toys with in this category are meant for throwing, chasing, and keeping your dog active. Our toys are made from high quality TPR, nylon, and rubber and hold up to active and energetic dogs. Our plush and mixed material toys are perfect for cuddling and playing. We use a variety of the softest plush, perfect for snuggling. Then we mix in rope, teethers, TPR, tennis balls, and other materials for added playability. There's no need to sacrifice fun for durability in Chomper toys! Our tough toys offer extra strength and stability for dogs that love to chew. With sizes for both small and large dogs, the heavy weight material is bonded, bound, and stitched to provide extra durability to withstand rough play. Treat dispensing toys make sure your four legged friend stays occupied. Toys in different shapes and materials can be played with on their own or treats can be inserted for added fun! Our interactive braided rope is perfect for dogs that love to pull, tug, and yank. Made from high quality materials and able to be braided into multiple styles, the rope is mixed with tennis, TPR, and rubber shapes to give every toy a unique purpose and shape.